Few things say “comfort food” to me louder than rice pudding. Now let me make it clear that just any rice pudding will not do. I have had a creamy, rice-y dessert at cafeterias, and tried the packaged products sold in supermarkets. These bland, sloppy imposters are not for me. THIS rice pudding, no less creamy, but with body and flavour, and a thin film of cinnamony crust is the only one for me. When my mom made this recipe for our large family she (at least) doubled it, first cooking the rice in the famous large copper-bottomed pot and baking the assembled pudding in her (also famous, family-wide) red Pyrex bowl. This bowl is now in the custody of my youngest sister, but I have had the good fortune to have found its mini-me at a garage sale. It is fully capable of holding the single recipe, which is just right for the two of us, with leftovers. 1. Cook one cup of dry rice according to package directions or your own recipe. 2. When cooked (and drained, if needed), stir in one cup of granulated sugar. At this point you may choose to stir in some dried raisins. I always do. 3. 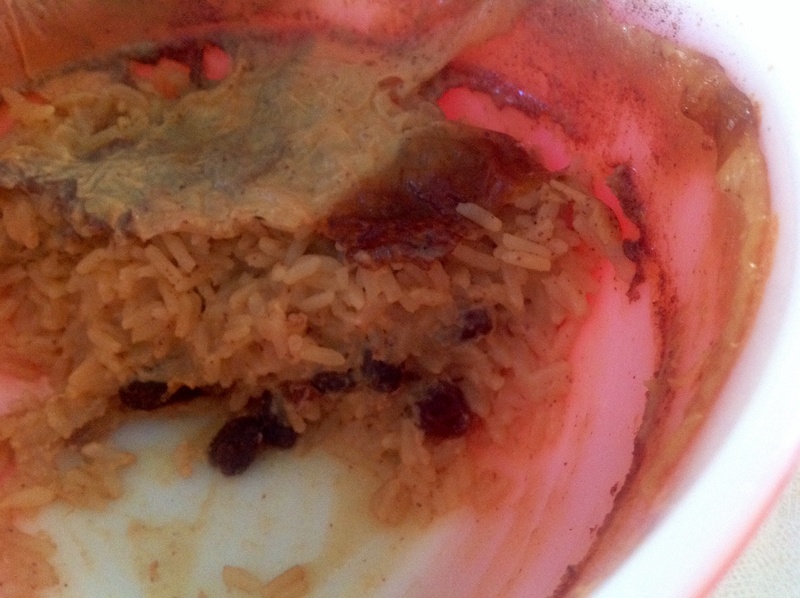 Pour the sugary rice into an ungreased one litre (one quart) baking dish, smoothing the top with the back of a metal spoon. 4. Over this mixture, slowly pour the contents of a 15 ounce tin of evaporated milk. Do NOT use sweetened condensed milk. Look for the word “evaporated” on the label. 5. Sprinkle the top of the milk generously with cinnamon and bake at 350 degrees Fahrenheit for about thirty minutes. Let stand as long as you have patience for before digging in. I usually last about a half hour. And those leftovers? One word: breakfast. This is also the rice pudding recipe for me, though I am willing to try others. I sometimes beat a couple of eggs with the milk before pouring over the rice mixture, and I don’t use quite so much sugar. I also like to bury a cinnamon stick in the mixture, as well as sprinkling ground cinnamon on top. Lastly, I nestle the baking dish into a larger one into which I pour boiling water about halfway up the side . This makes for a really creamy pudding. I don’t make it very often because no one else at my house likes it so I have to eat it ALL. Btw, Mom’s red bowl says hi!